If you have problems with oily and acne-prone skin, especially in the T-zone you should definitely stay clear of strong, cosmetic products which clog your pores and instead of fixing your problem, create even more. Instead of spending thousands of dollars on expensive skincare products which yield unsatisfying results in this article we are going to tell you how to get rid of oily skin in 3 simple steps. The first step towards how to get rid of oily skin is to clean your face every morning and every night. Choose a gentle face wash with low pH value which will remove the excess oil from your skin without damaging the protective layer. You mustn’t use aggressive soaps and face cleaners because they can have the opposite effect. Wash your face with warm water, but not too hot and pat your face dry with a clean towel. Do a face peeling once a week to remove the dead skin cells and dirt from the surface. At least once a week prepare a natural face mask which will additionally remove the excess oil and dirt from your face. Ingredients recommended for oily skin care are egg whites, cucumbers, green clay, lemon juice, tomatoes, yogurt and oatmeal. Here are a couple of really simple but effective face masks with just a few ingredients. Each of this masks should be applied on clean and dry skin. Egg whites – whip one egg until it gets foamy and apply it on your face. Leave it to dry and then rinse. You can repeat this 2 times a week. 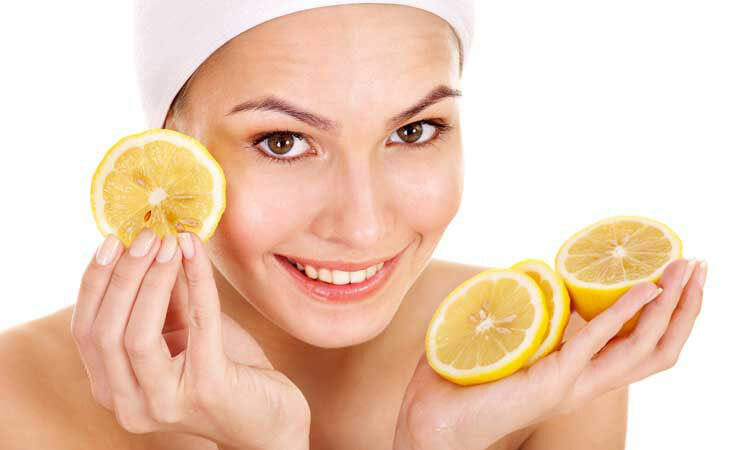 Lemon juice – mix one teaspoon of fresh lemon juice with half a teaspoon distilled water and apply this mixture on your face with a cotton ball. Leave it on for 10-15 minutes and wash with warm water. The lemon juice has astringent properties and can leave your skin feeling dry so apply some oil-free moisturizer afterwards. Yogurt – Mix one tablespoon of organic yogurt with one tablespoon of ground oatmeal and add a teaspoon of melted honey. Stir everything until it’s combined and apply the mask on your face. Leave it for 10-15 minutes and rinse with warm water. Aggressive creams and cosmetic products can further make your T-zone even oilier so they should be avoided. When shopping for makeup choose a mild foundation and gentler make up products. It would be best if you can find products which contain natural AHA acid, vitamins A and E.